The Balwen Welsh Mountain sheep is a sheep for all seasons. One of the original Welsh breeds of sheep the Balwen remains as one of the most striking and versatile of all the rare breed sheep. 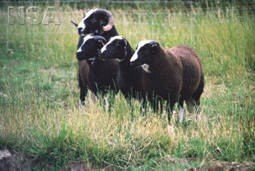 The sheep has a base color of black, dark brown or dark grey. It has a white stripe running from the pole of the head to the top of the nose, four white feet and half white tail. Average mature ewe weighs 40-50kgs, rams 45-60kgs.